The only thing better than BitTorrent is more BitTorrent, which is why we created BitTorrent Plus. Because we appreciate you, our loyal, dedicated fans, we decided to give away five BitTorrent Plus subscriptions (a $24.95 value each), good for one year, as our way of saying “thank you” for supporting our technology for more than a decade. 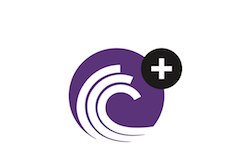 To enter for a chance to win a year’s subscription to the finest torrent client around, all you have to do is show your support for BitTorrent somewhere on the Web (see below for details, subject to our contest rules here). You can get up to 4 entries (1 for each task you complete) and winners will be chosen at random from the eligible entries as of 5:00 pm, PST on May 1, 2012. So, the more of a social demon you are, the better your odds. Ready? 2) Like us on Facebook. If you already like our page, simply post a comment. 3) Follow us on Pinterest. Winners will be contacted on Friday, May 4th. Good luck! 1) You can set up a remote account and access your BitTorrent library anytime, from anywhere, and from any device that has a supported browser. 2) Since Plus supports most popular file formats, you can view your HD content as it was meant to be: in high-definition. That’s like having an HDTV on your computer (plus, it’s much less expensive). 4) Protect your PC and torrent library from viruses. Not all files are safe. With BitTorrent Plus, your torrent content is scanned, keeping your downloads safer from viruses, malware and other threats. *- Television playback when combined with Apple TV, Xbox, or PS3. Everything else you need to know about BitTorrent Plus can be found here. This entry was written by BT, posted on April 25, 2012 at 11:13 am, filed under Uncategorized. Bookmark the permalink. Follow any comments here with the RSS feed for this post. Post a comment or leave a trackback: Trackback URL. This is a great chance to win Bittorent plus subscription. With increasing scrutiny over torrents, this is what is required by me now. Badly. Hello, I’m a blind user of a computer and I’ve been really saddend by Torrent’s lack of accessibitly that’s been taken in Torrent? I’m not able to read the main menu bar and I’m unable able to read the what’s new, Can you please pass this on to a Torrent programmer if you arn’t one. Yes, absolutely. We apologize for the lack of accessibility and will take steps towards correcting this issue.